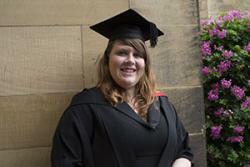 Elizabeth McManusBangor University has awarded its first, innovative ‘Women in Science’ scholarship worth £8,000 to Elizabeth McManus, 21, from Bolton, who graduated from the University’s School of Psychology in July. Bangor University is committed to increasing women’s participation in science at every level of education, and this Bursary is a further step towards encouraging and enabling more women to follow science careers. It responds to a ‘Women in Scientific Careers’ report by the House of Commons Science and Technology Committee which outlined the UK’s needs to address a shortage of skilled scientists, and the inclusion of women in research so that research is not gendered. Thrilled to have been awarded the scholarship, Elizabeth said: “It feels fantastic to have my achievements and future potential recognised and supported by this innovative bursary. Equality for women within science is incredibly important to me as I do not wish to be held back or treated differently because of my gender. I want to advance myself as much as I possibly can and push myself to be the best I can be in order to take my future career as far as possible. I feel that both the financial and mentoring support offered by this scheme will help me achieve my eventual career goals. The scholarship is funded by the University’s Bangor Fund, whose donors include alumni, staff members and friends of Bangor University, who all place importance on the value of higher education. The primary purpose of The Bangor Fund is to enable the University to deliver a margin of excellence or an element of additionality to the student experience. Bangor University runs various projects to attract and retain female talent as part of its commitment to the Athena SWAN Charter.